Valfajr is a smart torpedo system, designed and developed by Iranian experts. In 2011 it was presented by the Iranian Ministry of Defense. Brigadier General Hossein Dehghan (Iran's Defense Minister) and Flotilla Admiral Habibollah Sayyari (the Commander of the Iranian regular Navy) opened the production line on the 13 October 2015. In the opening ceremony, Dehghan stated that "the torpedo is capable of destroying various marine targets, including large vessels, in a few seconds." The torpedo carries explosive warheads that weigh approximately 220 kilograms and are capable of crippling naval targets in different weather and depth conditions. ↑ Advanced torpedo of valfajr. mehrnews. 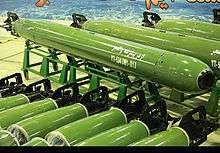 ↑ Line mass production of advanced torpedoes "Valfajr" opened. farsnews. ↑ Iran starts mass-production of smart torpedo. en.trend.